Go on, have another crack at it. In a world frustratingly awash with acronyms, we can at least recognise this one – DDT, that brutally toxic and offensively long-lived organochlorine pesticide used most widely in the 50s and 60s. Like many new discoveries, DDT was initially embraced with great enthusiasm. Swiss chemist Pauly Mueller actually won the Nobel Prize for discovering its applications. Over time we worked out DDT had horrendous environmental effects and major human health implications. It wasn’t banned initially, but became politically and socially unpopular and its use declined quite rapidly. This was seen by all as a great triumph, likely preventing the premature deaths of many thousands of humans and other species. The only problem was that phasing it out caused the premature deaths of many thousands of people. You see, one of the most important uses of DDT was as a residual insecticide used to control mosquitos and louse, respectively vectors for malaria and typhus. It turns that Mueller really did deserve the Nobel prize and probably saved millions of lives. The day we stopped using DDT to control disease, we ended up with some serious unintended consequences – the negative repercussions of seemingly positive changes. The lesson here is not to get rid of a bad solution until you’re sure you have a better one. This relates to the current war on plastic. We’ve recently seen the demise of single-use plastic bags. There seems no end to the back-slapping satisfaction of getting rid of these hideous polluters. No doubt it’s a good idea, but I fear the superior alternative is proving elusive. Firstly it’s worth pointing out that a number of authorities have stated that the scourge of plastic in oceans generally doesn’t come from NZ. While a walk along our waterways demonstrates we have some irresponsible citizens, generally we have a first world landfill system that centralises and contains waste extremely well. Here in NZ I’m left frustrated by some of these reusable shopping bags. Somehow I’ve acquired some plastic ones, which have about 40 times as much plastic in them than the supermarket bags. ‘At least I’ll be in the environmental black on use 41’, I thought, imagining that the durable nature of PVC would see them last for years … until the handle broke off one of them on the second use. It didn’t appear recyclable, so into the wheely bin and off to the landfill, seriously denting my environmental aspirations. I see some good alternatives of late, which seem to be holding up OK. Still, questions must be asked. One of the early movers were the hemp bags and what could be greener than hemp? The only problem is they are very pasty, likely bleached with dioxin, which is dumped in a river somewhere in Asia. I’d like to see a little tag on them explaining how wonderfully sustainable they are, but I bet no one has done any digging there. My big problem with banning supermarket plastic bags is the premise that they were ‘single use’. Every person I know uses the ‘single use’ supermarket bags as rubbish bin liners, bags for hiking boots, children’s toys, nappy bags while on the road, or whatever. Recently our stock of these shopping bags was running low and the first box of bin liners appeared. Ooh, they are nice – a big step up in quality and don’t leak like the supermarket ones. But they looked like they might have more plastic in them than the supermarket bags. Tedious as my life is, I got out the ‘drug dealer’ scales and set up a Saturday afternoon Weight Watchers session for plastic bags. I was right! The new bin liners weigh almost 30% more than the supermarket bags. I quickly rushed out to buy the lightest, lamest bin liners I could find. To my horror, these were still 12% heavier than the old supermarket ones. Taking an average of all the bags I had on hand, I suspect my household may now have 20% more plastic heading to the landfill, and we may one day be told that 20% more dolphins suffer as microscopic pieces of plastic cascade through their digestive tracts. To really deal the deal on environmental progress we need a truly biodegradable bin liner. Paper ones will leak and fall apart, unless they’re coated with wax or plastic. There are biodegradable plastics, but most need a 60C industrial composter to do the job. I’m not aware we have one of these in New Zealand. These ‘biodgradable’ plastics have two other problems. Firstly, they actually have a higher carbon footprint than petrochemical bags, as agricultural production uses more energy than simply extracting oil from the ground. Secondly, they are made from food staples like corn and the increased demand for these can force the price of corn up, making it unaffordable for some in the third world. This phenomenon was well-documented during the biofuels surge a decade ago. All this is frustratingly complicated, and you and I shouldn’t be left to work it out by ourselves. Somewhere out there are people who can do the analysis, build models and find solutions that represent genuine progress. I doubt that our best and brightest are enamoured with the prospect of developing a well-priced, environmentally-sustainable rubbish bin liner, but they should dust off a Nobel prize for the person who does it. I’m not joking about how challenging this task is. The low cost of plastic is mainly driven by the relatively low amount of energy used in its production. Even a simple paper bag has a higher carbon footprint than a plastic alternative. Firstly you have to cut down the carbon-friendly tree and then throw a great deal of energy into hauling it out of the wilderness and beating it to a pulp before you even have a raw material with which to form your bag. 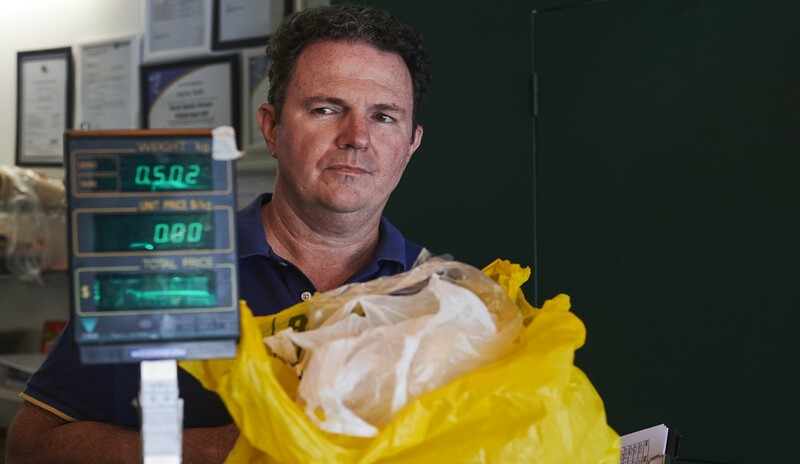 The responsibility for coming up with solutions falls to academia, government and the press – all of which have kept a too low profile on the complexities of the single-use plastic bag issue. That should have started by gathering some data on what happens to single-use plastic bags, how many are subsequently re-used and what solutions people would seek if this ‘single-use’ bag source was terminated. I am yet to see any information whatsoever about whether banning them has been beneficial or detrimental to the environment. The only way to avoid the issue of unintended consequences is to rigorously and objectively assess the implications of policy initiatives. As far as plastic is concerned, I fear the current war can’t be won – that is, we won’t be able to eliminated it entirely. Plastic is cheap, water and odour resistant, durable, light – a very attractive product in many ways. Your smoked salmon, bacon and milk come almost exclusively in plastic and that won’t change any time soon. What we need are domestic recyclers and they do exist. Flight Plastics in Lower Hutt opened our first domestic recycling facility for PET a couple of years ago. PET is one of the few plastics, sadly, where there is a private sector economic case for recycling. For many of the soft plastics, we’ve been shipping offshore … there is no ready solution. In cases such as this, it would be great to see the government incentivise, subsidise or otherwise facilitate recycling facilities. What these facilities need to be viable is critical mass. If the war on plastic cuts the volumes by 50%, all that might achieve is to kill off recycling as a viable option. Perhaps the light at the end of the tunnel are the new generation of Pauly Muellers, who are developing plastics made from waste agricultural products. All those waste apples and grape skins Hawke’s Bay produces could be the base on which an alternative plastics industry could be born. So perhaps putting all our resources into getting there might be the best approach, even if it takes a while. What is certain is that green initiatives driven by superficiality and popularism won’t get us far. Much deeper thinking and analysis is required.